This morning we featured some Amazon all-time lows on large capacity Seagate desktop drives and now we have a solid deal on some portable options. 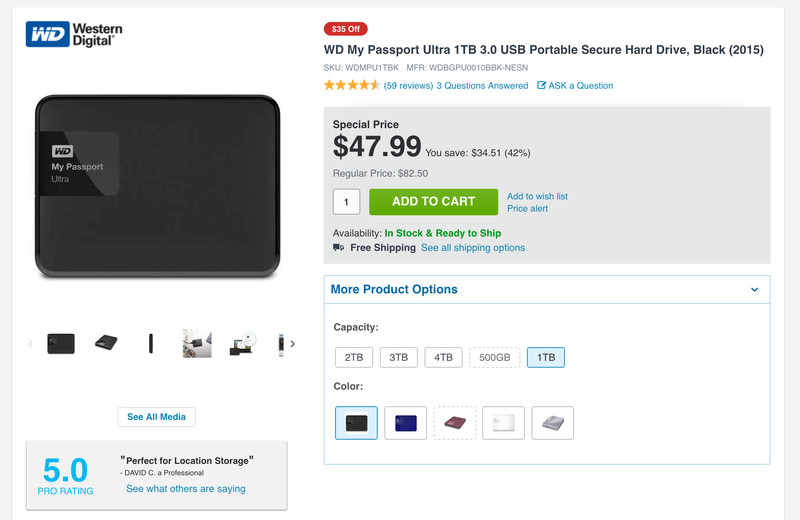 Earlier this month Amazon dropped the WD My Passport Ultra 1TB 3.0 USB Portable Hard Drive back down to its all-time low of $49.99, where it remains for Prime members. But now Adorama is offering the same drive for $47.99 shipped as part of its early Black Friday deals along with this DJI drone deal. It can go for as much as $80 and today’s offer is the best we can find. Rated 4+ stars from over 3,500 Amazon customers. Features below. We also spotted the Toshiba 3TB Canvio Basics Portable Hard Drive USB 3.0 (HDTB330XK3CA) for $79.99 shipped courtesy of Newegg’s official eBay Store. It hovers between $90 and $100+ at most retailers and today’s offer is matching the Amazon all-time low. Rated 4+ stars from over 2,500 Amazon customers. Features below. Help protect the contents of your drive by setting a password with 256-bit AES hardware encryption. With no impact to drive performance, you can lock and unlock your drive. WD Backup software makes it easy to protect your important files, photos, videos and music on your schedule, automatically.